Losing is no fun. A losing streak is even worse. A 31-game losing streak? Well, that’s another thing altogether. In the case of the Tufts University Jumbos, it was an embarrassing reminder of a mountain they needed to climb in order to gain the respect of their peers. I had spent all of last season covering every game at home and on the road in the hopes that they would finally break the streak that had been haunting the program for so long. It was a long and frustrating season for everyone involved, myself included, but the team showed signs of improvement, keeping most of the games competitive. Of course, there’s no such thing as a moral victory in sports, especially with the longest active streak in college football on everyone’s mind. 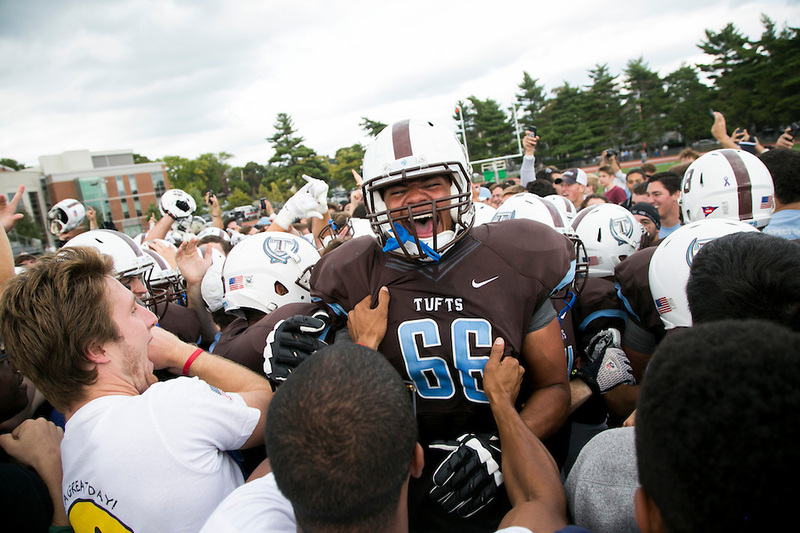 This season, however, there was a buzz in the air as Tufts was set to open the season against Hamilton, a NESCAC rival that gave up the last Tufts win all the way back in September 2010. Thanks to the access granted to me by head coach Jay Civetti, I was able to spend a few days with the team as they prepared for the season opener. As an institutional photographer, it’s my part of my job to highlight the program and to show off the hard work and dedication that these student-athletes put in to their sport that their classmates might not otherwise see or even be aware of. In this case, the pressure was apparent. Everyone knew what was at stake. Building on the foundations and work ethic they had set the previous year, the Jumbos stormed out to an early lead and never let go. When the game clock ticked down to zero, it was like a champagne cork going off, as the pressure that had been building up over the past 4 years finally let out. An effort well earned, no doubt. You can see a loose edit of my coverage below, and to see full team coverage, be sure to check out Tufts Athletics. When it comes to pro football, it’s pretty much a given that if I’m covering the game, the weather is going to be terrible. Last year, it was the playoff game against the Broncos in single-degree temperatures. The two times before then, when I was working for Sports Illustrated as an assistant, it was pouring rain and sleet. My streak of bad weather NFL games was kept intact when the San Francisco Chronicle gave me a call asking if I could cover 49ers’ visit to Gillette Stadium to take on the Patriots. With a wintry mix in the forecast, it had all the makings for terrible shooting conditions. Despite the weather-related challenges, we were treated to a game with plenty of action all around. 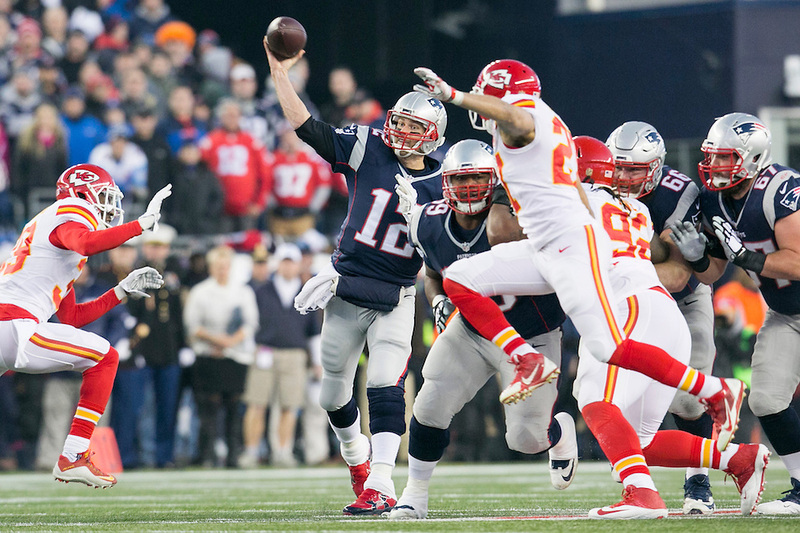 When the Patriots went down 31-3 early in the third quarter, the team looked cooked. But Tom Brady being Tom Brady, that was anything but the case, as the Pats rallied to erase a 28-point deficit. It wasn’t enough, though, as the 49ers managed to pull off one final score to win it, 41-34. Much thanks to Luanne Dietz at the Chron for hooking me up with the job. I don’t get to shoot enough football these days, so it was definitely a treat! 12/16/12 – FOXBORO, Mass. – 49ers wide receiver Randy Moss hauls in a touchdown catch against the Patriots in the first quarter of their game at Gillette Stadium on Dec. 16, 2012. 12/16/12 – FOXBORO, Mass. – 49ers wide receiver Randy Moss, left, celebrates his first quarter touchdown against the Patriots with quarterback Colin Kaepernick, center, and tackle Joe Staley in their game at Gillette Stadium on Dec. 16, 2012. 12/16/12 – FOXBORO, Mass. – 49ers safety Donte Whitner and Patriots wide receiver Wes Welker dive for a fumble in the first quarter in their game at Gillette Stadium on Dec. 16, 2012. The fumble was overturned upon review. 12/16/12 – FOXBORO, Mass. – 49ers fans cheer on their team in the first quarter against the Patriots at Gillette Stadium on Dec. 16, 2012. The 49ers won, 41-34. 12/16/12 – FOXBORO, Mass. – 49ers running back Frank Gore gets tackled by Patriots linebacker Brandon Spikes in the first quarter in their game at Gillette Stadium on Dec. 16, 2012. 12/16/12 – FOXBORO, Mass. – Patriots wide receiver Brandon Lloyd gets tackled by 49ers cornerback Tarell Brown in the second quarter of their game at Gillette Stadium on Dec. 16, 2012. 12/16/12 – FOXBORO, Mass. – 49ers cornerback Carlos Rogers runs back an interception in the first quarter against the Patriots in their game at Gillette Stadium on Dec. 16, 2012. 12/16/12 – FOXBORO, Mass. – Patriots running back Danny Woodhead dives into the end zone for a touchdown ahead of the tackle from 49ers safety Dashon Goldson in the third quarter in the Patriots' 41-34 loss to the 49ers at Gillette Stadium on Dec. 16, 2012. 12/17/12 – FOXBORO, Mass. – 49ers wide receiver Michael Crabtree breaks a tackle from Patriots cornerback Kyle Arrington, scoring a touchdown on the play, in their game at Gillette Stadium on Dec. 16, 2012. The 49ers won, 41-34. 12/17/12 – FOXBORO, Mass. – 49ers defensive tackle Ray McDonald loses his helmet as he sacks Patriots quarterback Tom Brady in the fourth quarter of their game at Gillette Stadium on Dec. 16, 2012. The 49ers won, 41-34.